Last edited by ChewyChewy on Wed Jan 13, 2016 12:05 am, edited 1 time in total. heh, I take it this is based on your comment in the chat thread the other day. fun. Last edited by ChewyChewy on Wed Jan 13, 2016 12:06 am, edited 2 times in total. The Chimera sure isn't subtle if Vanilla can openly explain about her cursed blessing. First time for McGruff to appear. I was thinking you might have use a Captain Ersatz substitute like McGurdle from Honorable Intention's fic or when Rick use Alan and the Groundsquirrels. I'm enjoying this as per usual Chewy. Vanilla getting some sort of power in interesting, a great idea obviously. I'm unsure exactly what she'll do with it, but I think that's why I like Vanilla so much. Smart, yet unpredictable, but in that way where I always understand her reasoning afterwards due to your writing! As for Vanilla, seems she will need to repeat it a few more times at that! I'm pretty sure this isn't the Chimera's doing, but something else. Seeing as how she kinda blew the Chimera away and he wasn't expecting it. also, since I just read your first story with the Cakes, was that whole longest night thing the chimera's doing? or is there some other supernatural thing that caused that and this power? That longest night was a parody of A Christmas Carol, nothing more, nothing less. wrong. there weren't any ghosts (something less) and Vanilla, unlike Scrooge, woke up from her visions earlier than when she went in (something more). though I suppose those cancel each other out, so you may be right. but still, good to know it doesn't have much bearing on the main story. Last edited by ChewyChewy on Wed Jan 13, 2016 12:06 am, edited 1 time in total. Nice new characters! Are they a once only appearance? Last edited by ChewyChewy on Wed Jan 13, 2016 12:07 am, edited 1 time in total. Nice Lord Of The Ring's reference there! She only has super strength, now she's treated as if she's the juggernaut. so now I'm thinking this is the chimera's doing, but he made her stronger than he intended. So now he's scared. also, classing Twilight Zone reference in there. Which Twilight Zone reference? If I did make a reference it was purely an accident. Last edited by ChewyChewy on Sat May 04, 2013 11:09 pm, edited 1 time in total. It's GOOD that you took care of that troublemaker, Miss Cake. That chimera sure is a troublemaker. I hope she gives him a good punch in the face before he takes the power back. Oh please, the chimera screwed up more than likely and meant to give her emotional strength, but instead gave her physical strength. Now he is just covering. Vanilla couldn't be sure, but she thought it had an expression on its faces that indicated that it had not planned that. the only question is, did he make her stronger than he planned? did he give her the wrong kind of strength? did he do exactly as he planned, but didn't expect her to not be in control of it? @copper: Are you writing this story or am I? 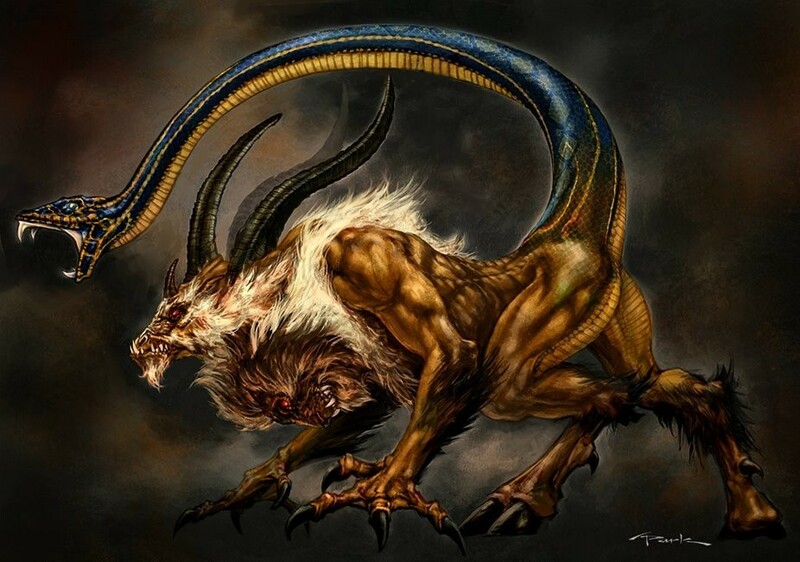 I imagine this version of the Chimera to look like this link only cuter? The thought of him/her/them cowering make this even funnier. Not "cuter", but more cartoony--like Discord in My Little Pony: Friendship is Magic. And that led to Honey having a layered dream experience. Not at all--Peter is more powerful than the chimera is. I tried to make that obvious--Peter wouldn't let the chimera do something. The chimera has no control over Peter. I actually forgot about Peter. I guess that's what he wanted, though. And so it ends... I wondered about Peter! So they are playing their own little game, eh? How fun! Honey and Vanilla hugging it out. Is there anything more precious than that? Who's "Brutus"? Do you mean Bruno? Yep, Bruno.... I keep wanting to call him Brutus! Only if there is a Cassius too!